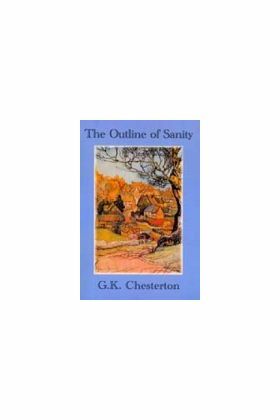 For Chesterton fans this collection of articles written over eighty years ago are vintage G. K. The author arranged the articles in book format by sections and chapters giving to the whole the salient title: The Outline of Sanity. 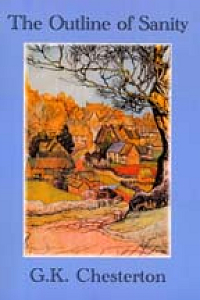 Accused by thickheaded social "progressives" of wanting to push society back into an antiquated agrarian provincialism, these insightful socio-economic indictions ought rather to have heralded the Catholic thinker as today’s prophet for social sanity. The perennial truths of the principles making up these critical commentaries will surely be even more evident in today’s restless age of stroboscopic consumerism. Master of paradox that he is, Chesterton, the philosopher, exposes the enslaving and dehumanizing aspects of an economy dependent upon monopolistic plutocrats and their so-called "labor saving" machines of mass production. With his penchant for balancing satire with humor, this literary giant provides a common sense solution to this age’s fast pace trek to nowhere. Modern man must be weaned gradually, he argues, back away from the imperialistic megalith corporation as a statistical wage earner and be productive on his own terms, on his own land. In order for man to achieve happiness, his true end, he must not build his life around some ephemeral retirement plan, but live each day for his real end: eternal retirement with God. Taking the original sense of the word economy as domestic harmony the ideal which the author champions is simply called Distributism. It is the very antithesis of Monopoly.